There are types of noxious weeds that are harmful or poisonous to humans, domesticated grazing animals, and wildlife. Open fields and grazing pastures with disturbed soils and open sunlight are often more susceptible. Protecting grazing animals from toxic weeds in their primary feeding areas is therefore important. For noxious weeds in flower or with seeds on plants, pulling 'gently' out and placing in a secure closable bag is recommended. Disposal such as hot composting or contained burning is done when safe and practical for the specific plant. Burning poison ivy can be fatal to humans. Using only certified weed-free seeds for crops or gardens. Maintaining control of noxious weeds is important for the health of habitats, livestock, wildlife and native plants, and of humans of all ages. How to control noxious weeds depends on the surrounding environment and habitats, the weed species, the availability of equipment, labor, supplies, and financial resources. Laws often require that noxious weed control funding from governmental agencies must be used for eradication, invasion prevention, or native habitat and plant community restoration project scopes. Agricultural needs, desires, and concerns do not always mesh with those of other areas, such as pollinator nectar provision. Ragwort, for instance, was rated as the top flower meadow nectar source in a UK study, and in the top ten in another. Its early blooming period is also particularly helpful for the establishment of bumblebee colonies. 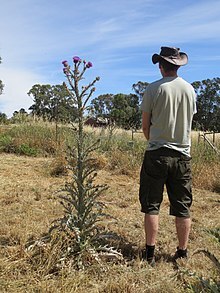 Thistles that have been dubbed noxious weeds in the US and elsewhere, such as Cirsium arvense and Cirsium vulgare, have also rated at or near the top of the charts in multiple UK studies for nectar production. These thistles also serve as a larval host plant for the Painted lady butterfly. There can be, therefore, a conflict between agricultural policy and point of view and the point of view of conservationists or other groups. Another example is seen in how the USDA's Animal and Plant Health Inspection Service (APHIS) Plants for Planting Manual bans all parasitic plants from being sold or planted in North America. Yet, many conservation seed companies offer Indian paintbrush (Castilleja species) seeds and plants. The 200+ species of Castilleja in North America is typically seen by conservationists as an important part of a high-quality natural meadow or similar landscape, along with some other members of the Orobanchaceae family, a family that includes 90 genera and over 2000 species. Castilleja plants often have showy flowers that attract hummingbirds, so they are considered valuable from an aesthetic point of view as well. Many of North America's species in this family are not threats to agriculture, yet they are banned by the USDA's sweeping prohibition on anything parasitic. By contrast, Rhinanthus minor ("Yellow Rattle"), native to North America according to the USDA, is very frequently cited by United Kingdom authorities as being a good plant to use to establish wildflower meadows, praised for its ability to control grass without herbicides. These UK writers say it can be easily controlled, by mowing it once before it sets seed. US writers, from an agricultural perspective, use dramatic language about the same plant, claiming that it's very noxious and threatening. It is typical to find the plant referred to as an infestation in these sources, while such language is never present in the UK sources. The US sources see the plant as invasive and describe only methods for destroying it. A third example is how garlic mustard, Alliaria petiolata, not native to North America, is seen by North American conservationism as extremely noxious, particularly for woodlands and woodland edges. Despite that, it is not included in the USDA's Federal Noxious Weeds List. It does not cause issues with agricultural fields, instead causing major damage to diverse plant communities. There has also been no approval for biological control agents for that species, the approval requests for even the monophagous weevil, Ceutorhynchus scrobicollis, being blocked many times by the USDA's Technical Advisory Group, TAG, even though experts had expected that it would be approved as early as 2004. In Australia, the term "noxious weed" is used by state and territorial governments. In Canada, constitutional responsibility for the regulation of agriculture and the environment are shared between the federal and provincial governments. The federal government through the Canadian Food Inspection Agency (CFIA) regulates invasive plants under the authority of the Plant Protection Act, the Seeds Act and statutory regulations. Certain plant species have been designated by the CFIA as noxious weeds in the Weed Seeds Order. Each province also produces its own list of prohibited weeds. In Alberta, for example, a new Weed Control Act was proclaimed in 2010 with two weed designations: "prohibited noxious" (46 species) which are banned across Alberta, and "noxious" (29 species) which can be restricted at the discretion of local authorities. New Zealand has had a series of Acts of Parliament relating to noxious weeds: the Noxious Weeds Act 1908, Noxious Weeds Act 1950, and the Noxious Plants Act 1978. The last was repealed by the Biosecurity Act 1993, which used words such as "pest", "organism" and "species", rather than "noxious". Consequently, the term "noxious weed" is no longer used in official publications in New Zealand. Section 14 of the Wildlife and Countryside Act 1981 makes it an offence to plant or grow certain specified plants in the wild, listed in Schedule 9 of the Act, including giant hogweed and Japanese knotweed. Some local authorities have by-laws controlling these plants. There is no statutory requirement for landowners to remove these plants from their property. The federal government defines noxious weeds under the Federal Noxious Weed Act of 1974. Noxious weeds are also defined by the state governments in the United States. ^ Hicks, DM; Ouvrard, P; Baldock, KCR (2016). "Food for Pollinators: Quantifying the Nectar and Pollen Resources of Urban Flower Meadows". PLoS ONE. 11 (6). Bibcode:2016PLoSO..1158117H. doi:10.1371/journal.pone.0158117.